Travel in Asia is hard, really hard. There are a number of aspects which began to wear on us after a while – the different conception of personal space, a near constant jockeying to get in front of the next person wether it be on the road or in a shop or waiting for a table. The myriad of different languages and dialects makes being able to speak more than a few words nearly impossible and charades necessary to convey our thoughts/needs, a constant and very real worry about being run over every time you walk out of the hotel, not being able to read the signs, etc.- everything takes effort. What is initially a fabulous “cultural experience” becomes a grating irritation with extended repetition. Now, this is not so say that we did not enjoy Asia, in fact, we loved it. 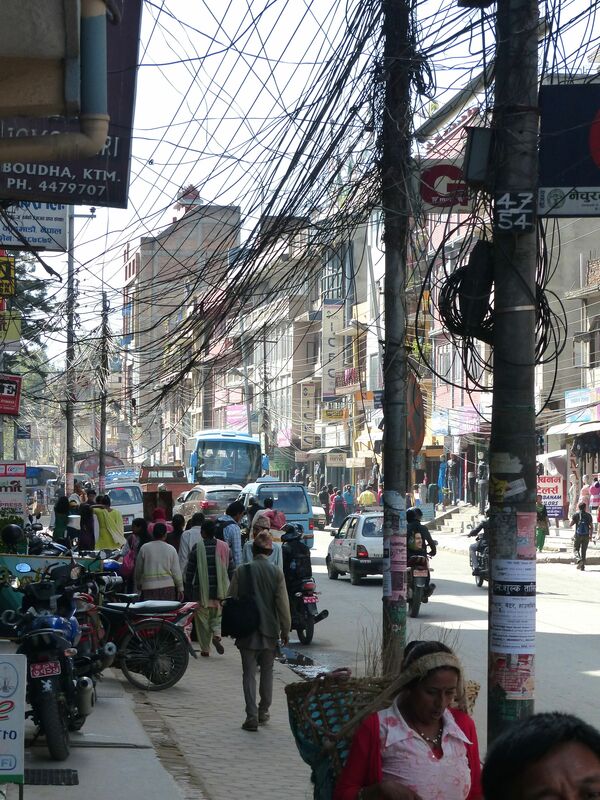 Personally I found Kathmandu to be one of the most intriguing (albeit gritty, dusty and chaotic) cities in the world and would go back in a heartbeat. But travel in Asia is challenging. 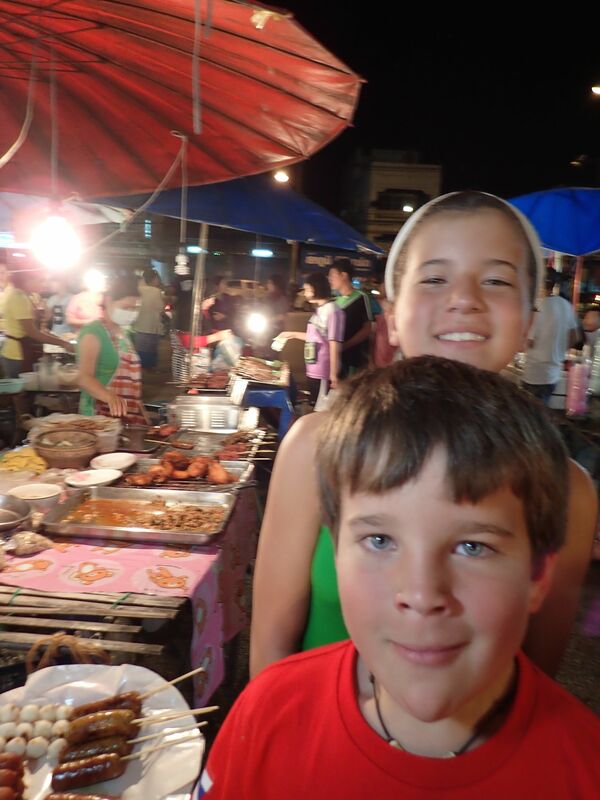 The week we vacationed in Thailand afforded us an amazing respite from the real world. It recharged our batteries and provided time for us to ponder for what we will do in our last half year of travel. Sometimes we were a little closer to our dinner than we would like. Unfortunately, this clarity lead to the decision that six weeks in China and Japan would be too much of a challenge for us at this point. We were all incredibly excited to walk along the Great Wall, hike the Nakasendo Trail, view the Terracotta Warriors, etc. but none of us were sure we could really enjoy the experience as much as we would like to because we are beginning to feel the fatigue of long term travel. When we broached the subject with the kids, they quickly concurred that China and Japan would be best done as its own separate trip at some point in the future when we had more tolerance for things that are “different”. 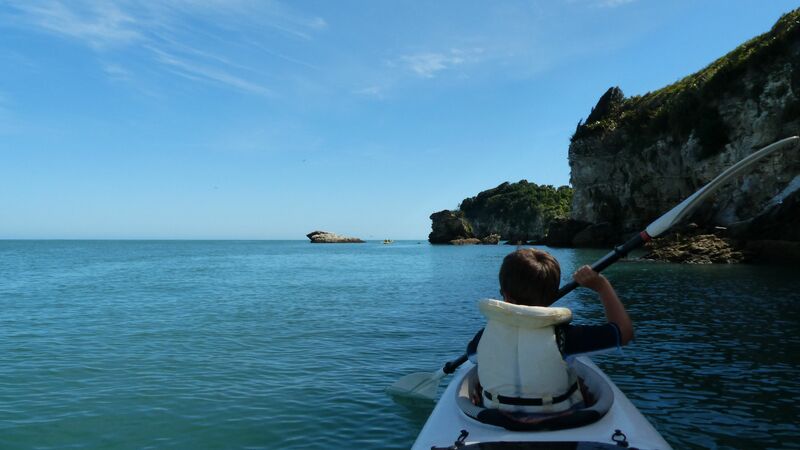 Right now, we want things that are easy and New Zealand has to be the most pleasant place to travel in the world. After more than two months in Nepal, Bhutan, Thailand, and briefly Cambodia, we headed to the Land of the Kiwi for a five week road trip. Like Patagonia, going to New Zealand had been a lifetime dream for Colburn – world class landscapes, great wines, amazing hiking and fishing – and all in one compact country. I had biked around the South Island with my brother more than 20 years ago and recalled the spectacular scenery, the kind locals, good beer and ease of travel fondly. Initially when we planning our trip, we thought that we would save Australia and New Zealand for a time when we weren’t able to tolerate difficult travel as well as we can at this point in our life. However, the challenges of our time in Asia and the fact that our kids are big Lord of the Rings and Hobbit fans, lead to the decision that this was the perfect time for New Zealand — and we were right! It is a beautiful land with incredibly kind people and an amazing infrastructure which makes travel effortless. Everything works as it should: people wait patiently in a queue for their turn, cars follow the rules of the road with great care, the food is pleasantly bland, you can drink the tap water pretty much everywhere, toilets are the sit-down type and flush, and people mostly speak the same language, although there have been a few times we’re not really sure what they are saying because of the local tendency to leave off the ending words (i.e. “the river’s clear all in” for “river is clear all in all”). Our first night we went to a brew pub and were giddy with excitement that they had salad, nachos, and steak sandwiches on the menu. It seemed too good to be true! They have all of the necessary day to day items in one place so you don’t have to go to the pharmacy to buy shampoo then to the kiosk to get crackers before passing by the vegetable seller to get veggies and and finally on to the bread shop to get bread. The people look like we do, except for the men in short shorts (rugby shorts ala the 1980’s) and low-cut rubber boots. There is laughter and smiles and people in casual conversation every where you go. It is very much like home, but in a foreign land. To begin our tour of Middle Earth, we started with an afternoon tour of the recreated Hobbiton just outside of Auckland. 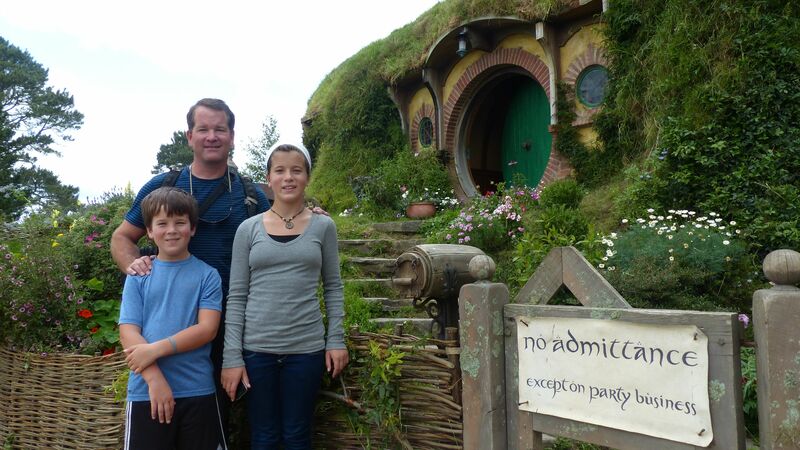 Located on the Alexander family farm, the Hobbit Holes were built with durable materials (not styrofoam) for the last two Hobbit movies as part of the filming agreement. The family run enterprise has turned in to a blockbuster tourist attraction supporting not only family but the entire local town. The area is spectacular – every bit as bucolic and idyllic as it is in the movies. The Holes are simply facades but well-tended with beautiful gardens and props throughout, leaving the feeling that you really are in Hobbiton. The tour concludes with a pint of ale or ginger beer at the Green Dragon Tavern, the only fully created structure on site. We thought the kids heads were going to explode when we saw the different locations – Gandolf’s Cut, Bag End, the Party Tree, etc. They really had a great time seeing the locations “for real”. The perfect follow up to our tour of Hobbiton, as a Christmas surprise, we spent a couple nights in our very own Hobbit Hole. 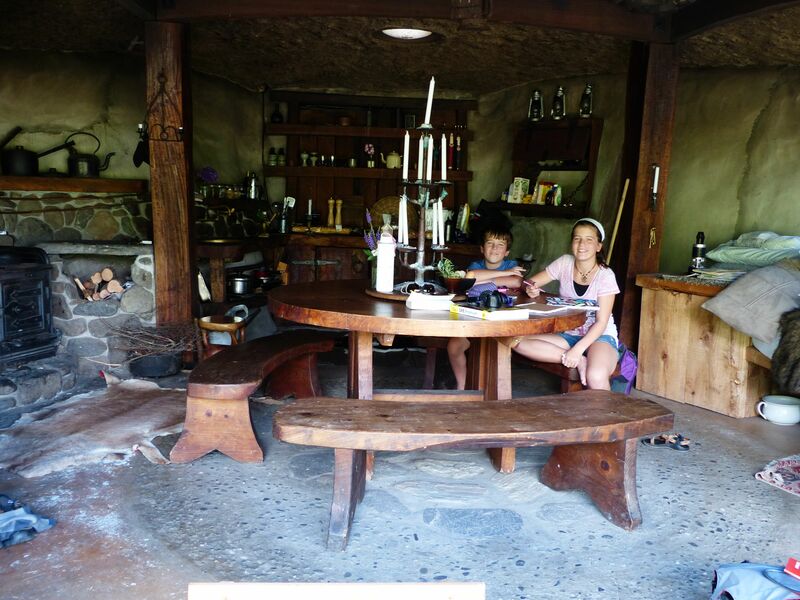 A labor of love for a local family, they built an in-earth cabin on their farm over a period of probably 20 years, long before the Lord of the Rings and Hobbit became an international movie franchise. Lovingly built from local timbers and stone, the hole contains a double bed, coal-fired stove, hot water heated through the coal stove, and incredible period furnishings. There is a modern bathroom with composting toilet and an outdoor claw-foot bath tub. The Hole is located on the back of the farm, nestled between small hillocks, with a pond just in front, so there is complete privacy. We felt as if we were far, far away from any civilisation, yet able to get to town in under 20 minutes. 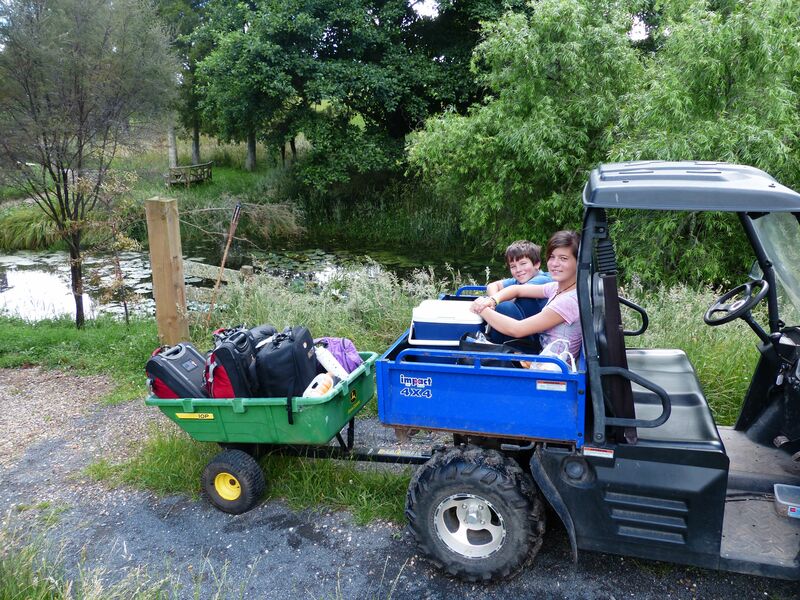 We spent most of our time reading, enjoying the quietness of a rural environment, and only ventured out one time to see the Waitomo Glow Worm Caves. The glow worms aren’t really worms at all (they are larvae for a mosquito-like insect but “glow larvae” or “glow maggot” isn’t nearly as marketable as “glow worm”) but, wow, what an incredible experience to be floating in the utter darkness of an underground river with the ceiling of the cave lit up by thousands of tiny blue lights that twinkle like stars in a clear sky. It was absolutely magical. 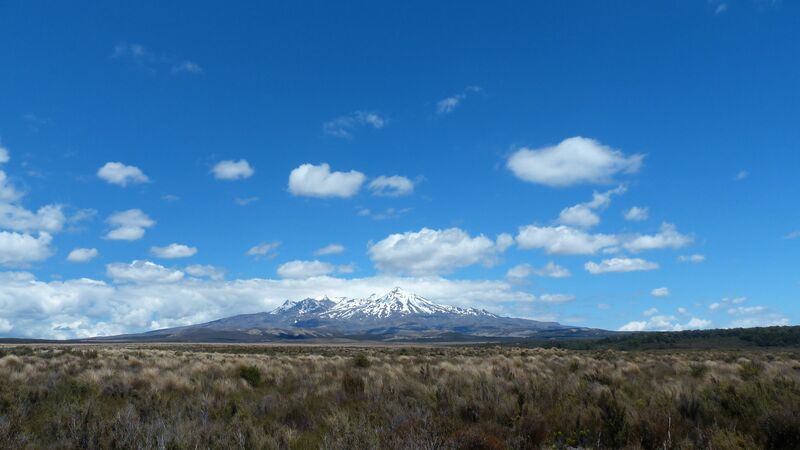 Our pursuit of Middle Earth continued with an expedition to find Mount Doom. While the movie version was computer enhanced, the inspiration for it came from Mt Ngaruhoe in the Tongariro National Park. We had planned to hike the Tongariro Crossing, a spectacular full-day hike which crosses below Mt. Doom, on Christmas Eve, but the combination of questionable weather and the desire to have a “real Christmas”, as our kids put it, lead us to just do a drive-by on our way to Taupo. Still, it was impressive to see the perfectly formed cone volcano silhouetted in the blue sky. Mac commented, “we really are in Middle Earth, aren’t we?” He has become so interested in the story that he is actually reading the book of The Hobbit, his first challenging novel read voluntarily. Celebrating Christmas while traveling the past two years has allowed us to view the granddaddy of all holidays differently. At home we have seven or eight Roughneck bins chock full of Christmas decorations. Like many Americans, we begin the process (hanging lights, decorating, Advent calendars, baking cookies, etc.) just after Thanksgiving, taking the better part of a month to prepare for the big day. It is a really, really big deal. However, these past two years have been substantially different, especially since we’ve been in the Southern Hemisphere so Christmas is celebrated in the middle of summer. Last year we were trekking in Patagonia until a couple days before Christmas so could only really start getting “ready” on Christmas Eve. Also, the Argentine Christmas is much less commercial than in the US, so there wasn’t the country-wide frenzy that we typically feel. It was lovely family event without any of the pressure felt in the US. This year was similar in New Zealand. We had rented a condo on the quiet end of Lake Taupo (the largest volcano in the world) so we could be in one place for both Christmas Eve and Christmas Day. The kids wanted a Christmas tree but they are hard to come by here in the middle of summer so instead we cut out a tree shape from a roll of wrapping paper we bought at the grocery store. 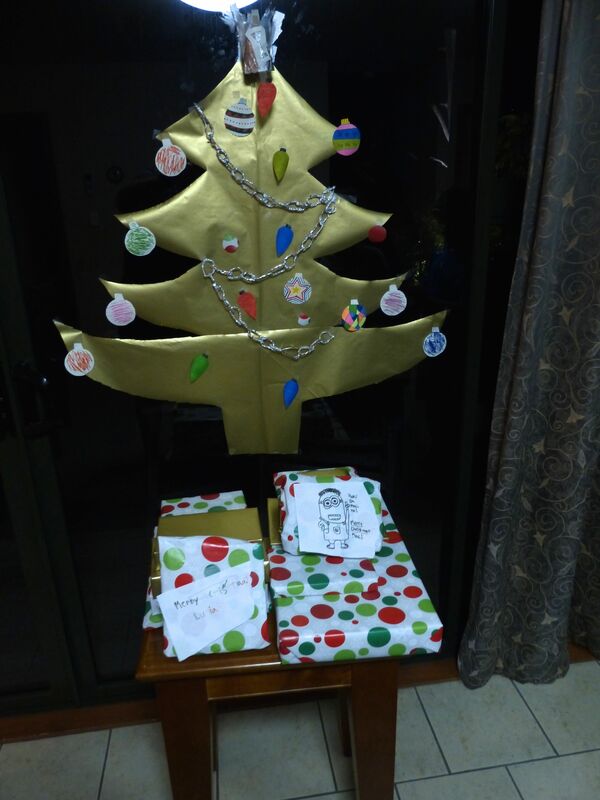 We all coloured ornaments on plain paper then hung them on the tree with wrapping tape. We used tinfoil to make silver garland and even topped our little tree with a tinfoil angel! It was all great fun and incredibly low-key. Colburn made his famous papa steaks and we ate an early dinner on the deck after taking a long walk at a trout fishery that morning. No hours spent flipping though cooking magazines for fancy dishes, no stress about hanging holiday lights, no worries about wrapping presents. Like last year, it was a lovely and relaxing day spent focused on being with family, not on the cultural expectations of the season. Now, to be honest, we have an advantage in enjoying a low-key Christmas since we don’t have much space for carrying things. We have all learned to not buy/have nearly as much as we would in the US. Presents had to be limited to what we could reasonably fit in our small rental car. Lucia has longed for real paper books to read as she is not nearly as fond of reading on the iPad, so she was able to indulge her reading obsession with six of the biggest books that would be absolutely unmanageable if we didn’t have our own car. Mac longed for a big Lego set to build, so he received a couple of Hobbit sets that could be broken down in to smaller bags for travel. They both got some candy to round out their gifts and were grateful for having received what they termed as so much. 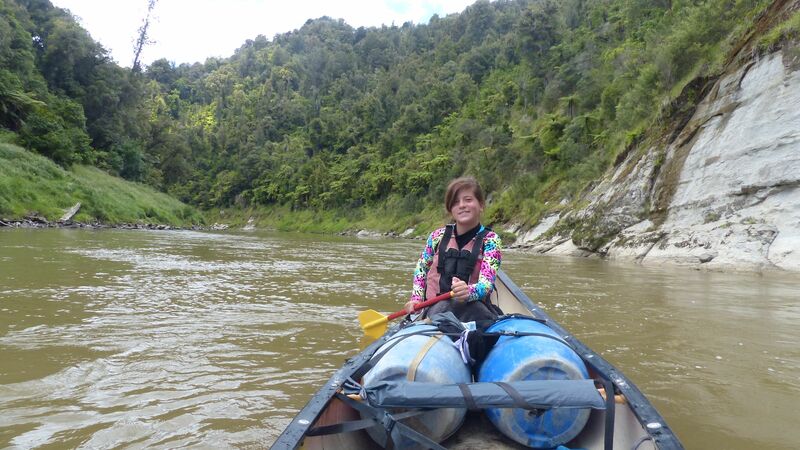 With Christmas behind us, we headed out on a four day canoe journey down the Whanganui River. Although considered a Great Walk, this 90km wilderness river journey takes the paddler through unspoilt land that looks as if it has been lost to time. Even though the area is second-growth forest, its not hard to imagine dinosaurs cruising through the totara trees and ferns which line the banks as the waterfalls cascade in numbers to great to be counted. Our pre-trip recognisance said that the paddle is considered to be a class 1+ (which means mostly flat water with an occasional rapid that needs minor care to negotiate) suitable for anyone who is fairly outdoorsy yet many accounts said that the chances of flipping were somewhere near 90%. As a former river guide, I am pretty comfortable with my skills on the water and Colburn has been canoeing since he was a toddler, but we both began to get a little apprehensive about such statistics. Colburn referenced his families’ legendary trip down the Delaware River when the rapids were a bit more difficult than they had expected and, although everyone was safe at the end of the trip, it became an iconic event in the family mythology. We were concerned that our Whanganui trip could easily go the way of the Shindell-Wright Delaware trip 30+ years earlier. The weather was cool and cloudy, so not one that invites swimming in a chilly river. Despite many years working and living on the river, I hate cold water, especially cold moving water. However, once we got on the river, our apprehension was allayed when we saw the quality of many of the other paddlers. They could hardly keep a boat straight in flat water or wanted to stand up and paddle Lewis & Clark style, so it was no wonder they might have difficulty with faster water. This proved to be true. In one rapid, we saw three out of four boats flip and even saw one of the boats flip a second time in a rapid further down the river. The good thing on the Whanganui is that, while a flip is cold and wet, there are no dangerous obstacles down-river, so it’s more inconvenient than scary. We were able to successfully negotiate every rapid without any excess water coming on board and had great fun showing off in some of the wave-trains. 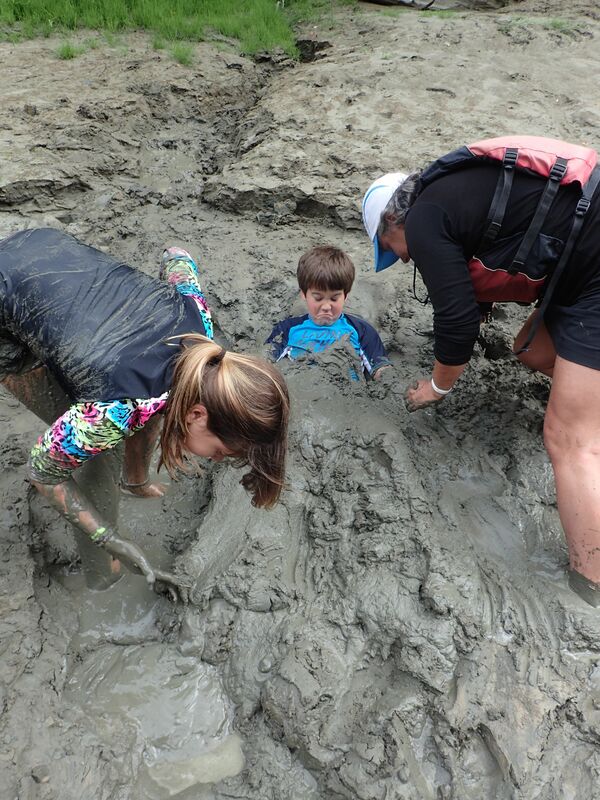 The Lord of the Rings theme continued on our trip with them pretending to be be uruk-hai spawning from the mud in the side-streams. Mac would occasionally break in to dwarven song from the Hobbit while we paddled through the quiet stretches. Lucia learned to steer a boat for herself and has become proficient at reading the water to determine her own route without mom or dad’s input. They both love the water as much as their parents do and we are excited to be able to have yet another great family thing to do when we get back to the US. Tired, dirty, and horribly bitten by sand flies (tiny black flies whose bite itches like crazy for several days), we headed to the capital city of Wellington to continue our tour of Middle Earth. We visited Weta Cave to see how Peter Jackson’s company did all of the effects and computer generated imaging for the movies. It was fascinating to see how they put together the costumes, created the weapons, and built the models they used. I remember as a teenager seeing how George Lucas made some of the Star Wars effects and being amazed. Now, 30 years later, seeing how they did LOR and the Hobbit, it brought back many of the same feelings. Some of the interesting tidbits that we learned were that the orcs and uruk-hai were all live actors, just really big guys! The elves had the hardest job because, once fully dressed, they couldn’t sit down at all. The dwarves were often the hottest on set because they all had to wear fat-suits under their costumes and the dwarves’ beards were the most costly element in the movie because they had to be hand-made every day. Viggo Mortensen, who plays Aragorn, is a method actor so had his sword with him all of the time and is reported to have been seen brandishing it while walking barefoot through the streets of Wellington. Apparently the cops were notified that he might be seen doing this, so it never was a problem. Having spent hours watching and re-watching the films, it was really cool to see how it was all produced. 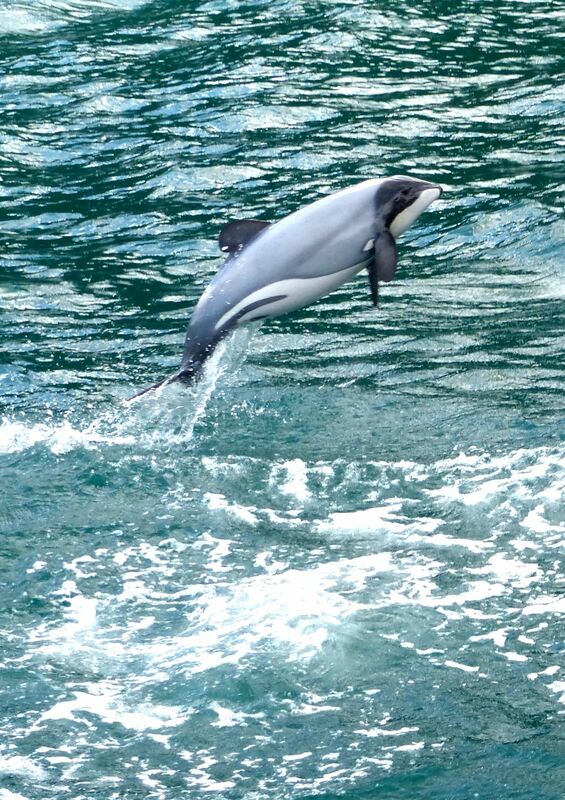 With our time on the North Island completed, we took a three hour car ferry to the South Island on New Year’s Eve. The weather had been unsettled so there were heavy grey clouds and rain as we headed to Nelson, purported to be sunniest city in New Zealand. We waited out the tail end of a rainstorm by tasting craft brews and getting some school done at the local pub. Although slightly premature in setting up our tents, quietly we ushered in the new year asleep in our cozy temporary shelters. New Zealand is a beautiful and welcoming country where the people are perpetually friendly, patient, and kind. We have noticed that people follow rules here – even when they are offered as suggestions – and not following them elicits a severe finger-wagging from the locals. When entering a town along a highway, the NO ENGINE BRAKES sign is worded politely asking drivers of large vehicles to please refrain from using engine brakes next 3 km. 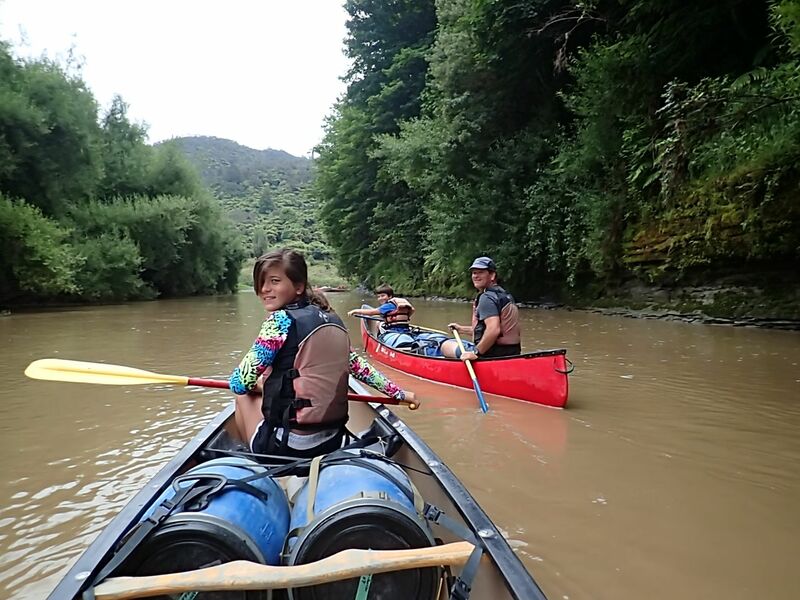 When we were on the Whanganui River, every person we saw was wearing their life vest fully buckled at all times while on the water – even the 20-somethings that were incredibly hung-over after drinking several bottles of whisky (we know because we they put up their tents right next to ours!). In the US, I would not have been at all surprised if they only used their PFDs as seat cushions or slung them over their shoulders only when they were going through a rapid. On the roads, drivers rarely pass unnecessarily and definitely not on blind curves or other dangerous sections. Almost everyone wears hats and sunscreen when outside. In one campground, our neighbour noticed our accent and came over with two sodas and two beers saying, “Welcome to New Zealand!” After visiting Bhutan, a county known for its pursuit of Gross National Happiness but where driving should be considered an extreme sport and most residents are polite but indifferent, it seems that the Kiwis have somehow attained that ideal, but without the need for advertising it to the world. New Zealand is definitely the place where we have felt truly at home in a foreign land. Wow! 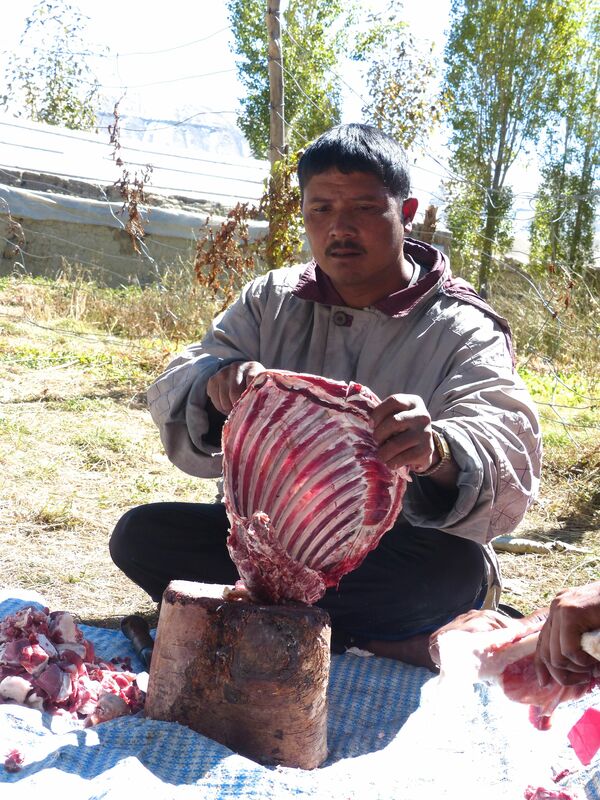 Geat trip. 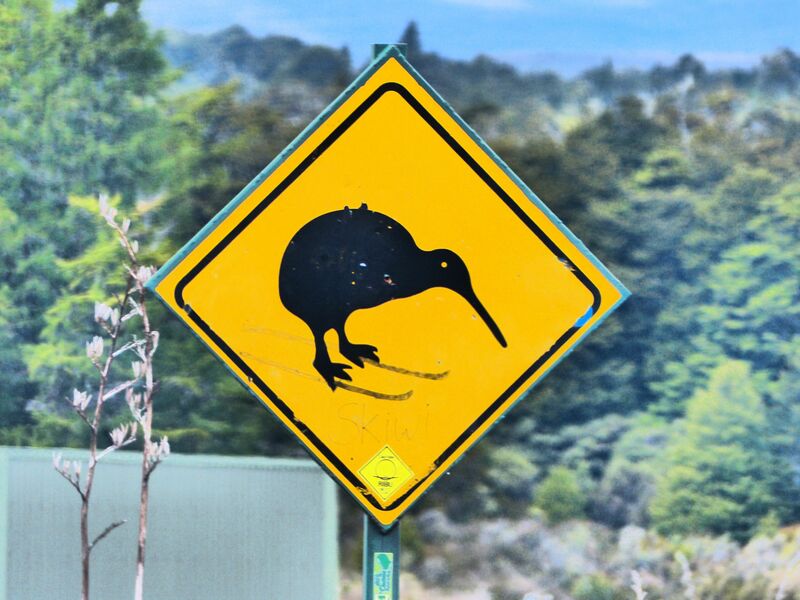 Certainly brings back memories of our trip to NZ. We loved the people and the place. We’d go back in a heartbeat. Keep having a great adventure. Maybe we’ll see you in Massachusetts??? Love to you all. We miss you. Are the adults traveling with these explorers aware of how BIG their kids are getting, the maturity on their faces!…OMG! Thanks Joe! Yes, despite being with them 24/7, we see the changes in what they do, how they handle situations, etc. Sometimes it kind of hits us over the head, other times it is more incremental, but it’s always there. They aren’t little kids anymore. I agree that China and Japan should be a separate trip. Gary and I hiked the Great Wall for 2 days in a remote area and it was fabulous – a tale for another time. We spent 3 weeks in China and barely touched it. And Japan – clean, polite, great food, potable water, real toilets, fabulous steam/hot tub resorts and many repetitive, boring temples. And New Zealand – as wonderful as you said. We hiked the Milford track with a guided group – amazing! 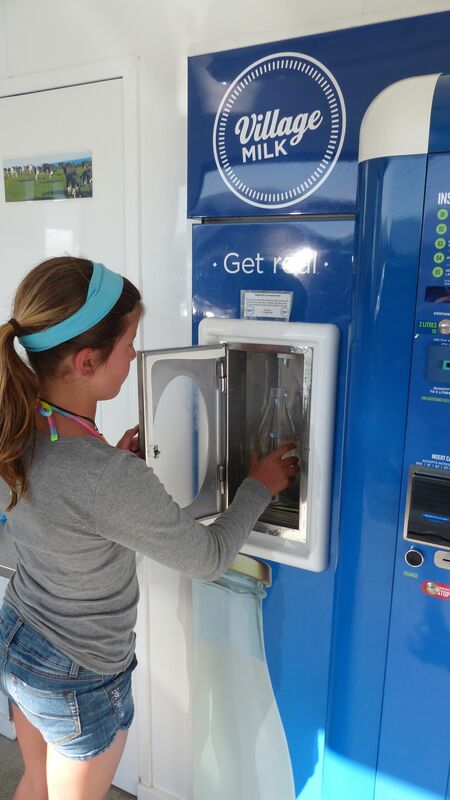 Keep us in the loop – we love your updates!